Satisfy your pet’s need for real food with Instinct by Nature's Variety Original Grain-Free Recipe with Real Chicken Dry Cat Food. Guided by Instinct’s belief in raw nutrition, this recipe unlocks your cat’s ability to thrive. It’s thoughtfully balanced with wholesome foods, like real chicken and vegetables, plus guaranteed levels of probiotics, natural omegas and antioxidants. 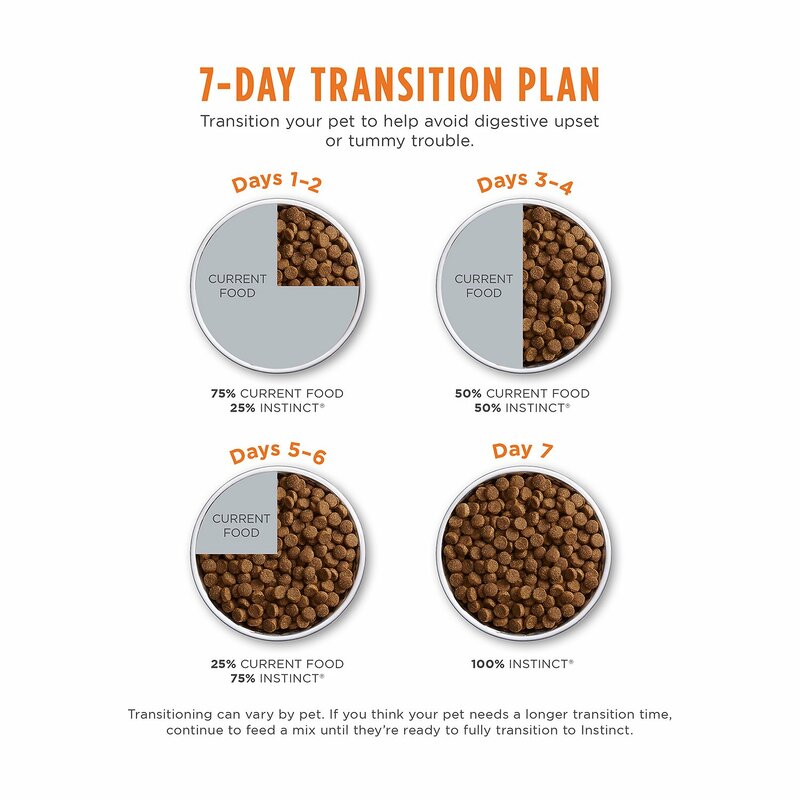 The result is a tasty, high animal protein diet that promotes maximum digestibility, a healthy coat and skin, and immune health. Cage-free chicken is the first ingredient for high animal protein to support strong, lean muscles. 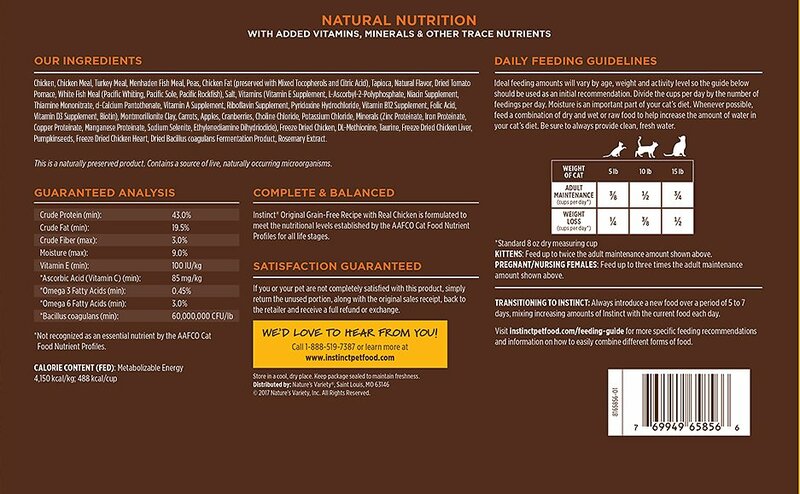 Features 81% real animal ingredients and nutritious oils, plus 19% fruits, vegetables and other wholesome ingredients. 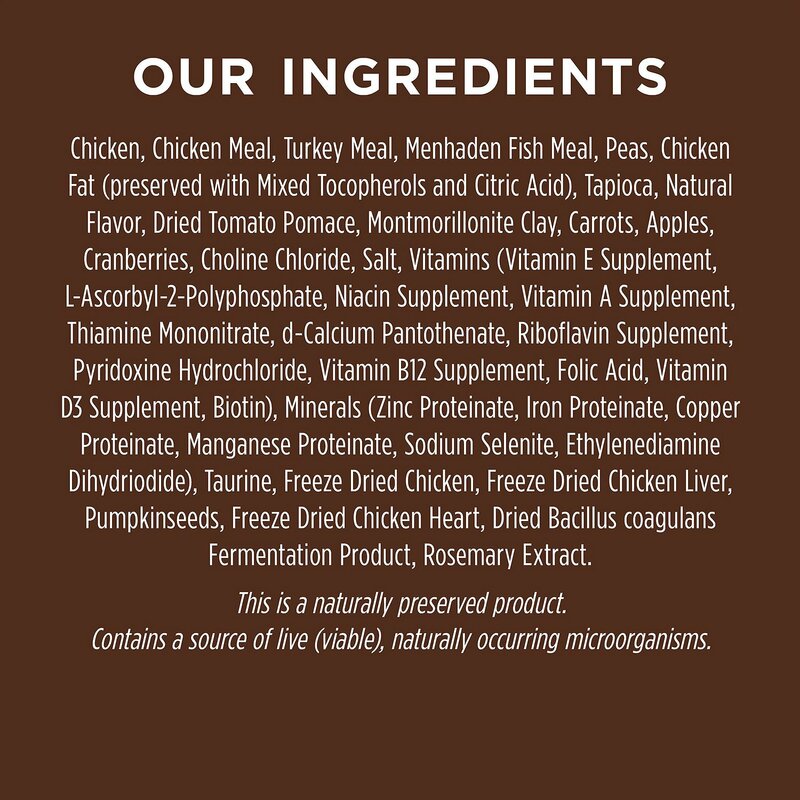 Never contains any grain, potato, corn, wheat, soy, by-product meal, artificial colors or preservatives. Guaranteed levels of live, natural probiotics, natural omegas and antioxidants to support digestive health, healthy skin and coat, and immune health. It’s the only kibble with the pure, real nutrition of raw in every piece, and made in the USA with the finest ingredients from around the world. Chicken, Chicken Meal, Turkey Meal, Menhaden Fish Meal, Peas, Chicken Fat (preserved with Mixed Tocopherols and Citric Acid), Tapioca, Natural Flavor, Dried Tomato Pomace, White Fish Meal (Pacific Whiting, Pacific Sole, Pacific Rockfish), Salt, Vitamins (Vitamin E Supplement, L-Ascorbyl-2-Polyphosphate, Niacin Supplement, Thiamine Mononitrate, d-Calcium Pantothenate, Vitamin A Supplement, Riboflavin Supplement, Pyridoxine Hydrochloride, Vitamin B12 Supplement, Folic Acid, Vitamin D3 Supplement, Biotin), Montmorillonite Clay, Carrots, Apples, Cranberries, Choline Chloride, Potassium Chloride, Minerals (Zinc Proteinate, Iron Proteinate, Copper Proteinate, Manganese Proteinate, Sodium Selenite, Ethylenediamine Dihydriodide), Freeze Dried Chicken, DL-Methionine, Taurine, Freeze Dried Chicken Liver, Pumpkinseeds, Freeze Dried Chicken Heart, Dried Bacillus coagulans Fermentation Product, Rosemary Extract. Pregnant or Nursing Females: Feed up to 3 times the Adult maintenance amount shown above. 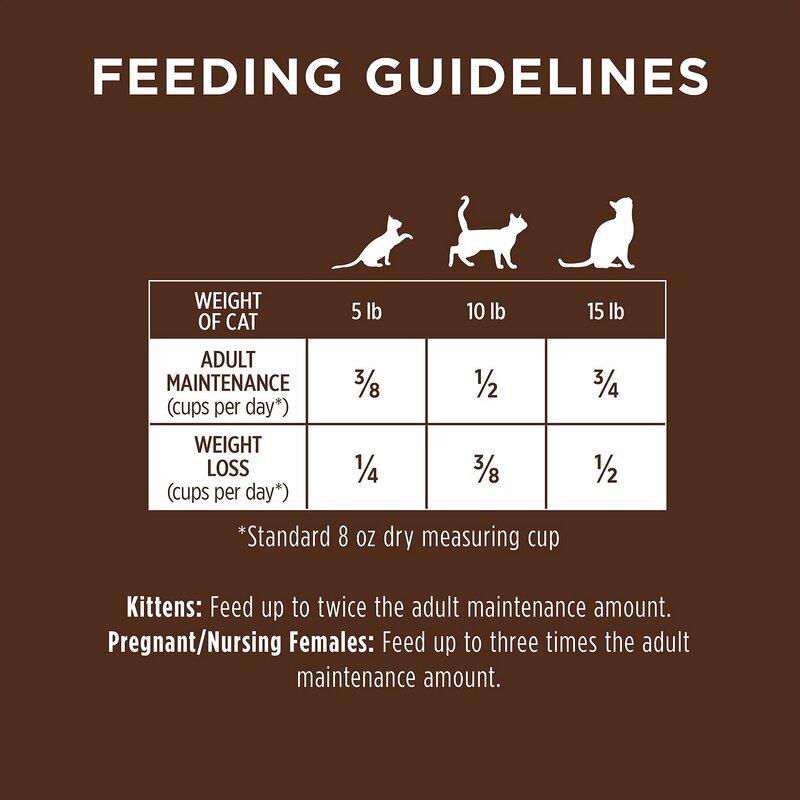 Ideal feeding amounts will vary by age, weight, and activity level so the guide below should be used as an initial recommendation. Divide the per day by the number of feedings per day. Be sure to always provide clean, fresh water. Along with dry food, we recommend feeding raw or wet food to help increase the amount of water in your pet’s diet. Always introduce a new food over a period of 5 - 7 days, mixing increasing amounts of Instinct with the current food each day. You'll find at least 70% real animal ingredients and nutritious oils, plus 30% vegetables, fruits and other wholesome ingredients. Made without grain, potato, corn, wheat, soy, by-product meals or artificial colors or preservatives. High animal protein, grain-free recipes guided by our belief in raw, each recipe starts with real meats like cage-free chicken, wild-caught salmon or farm-raised rabbit. 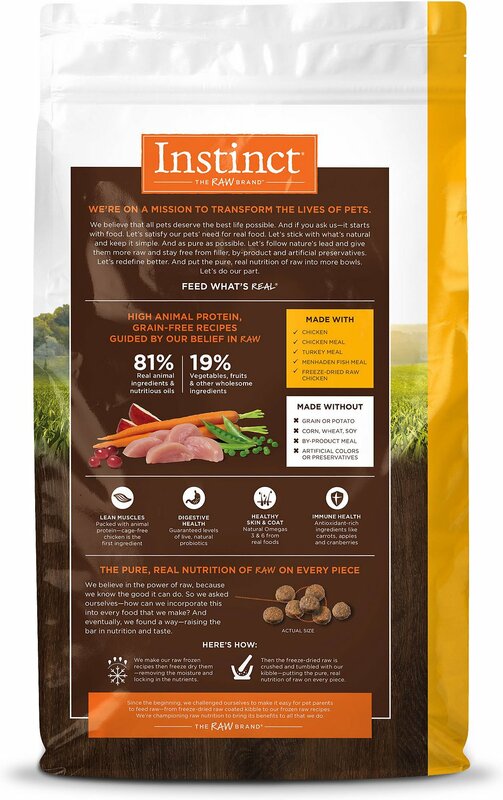 They put the pure, real nutrition of raw on every piece of Instinct Original by tumbling their kibble with crushed, freeze-dried raw — raising the bar in nutrition and taste. I've been feeding this specific brand to my girl and she is doing really well with it. Her fur and digestive system is very healthy. She also likes the taste which is a bonus since she is a little picky. 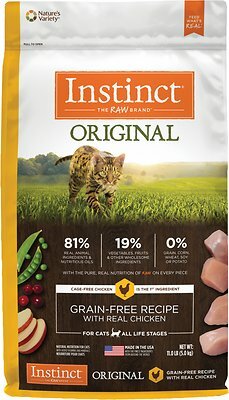 The kitten I recently adopted refuses to eat his kitten food by Hills Science Diet and will eat only the Instinct.So I tried the Instinct kitten and he loves it! I am in the process of transitioning my two kitties from the kitten food to the adult food. I noticed that their coats have gotten very silky since I adopted them about 7 months ago. My sons purchase the same food for their cats and we are all satisfied that they are getting quality food that is healthy and nutritious for them. I started my dog on the dog version since she was having problems with all other dry foods now that she is 10. She has done well on it so I got this one for my cat who is very fussy. Same thing..She loves it! I started out by mixing it with her prior food for over a week before going over completely to Instinct Original. All 4 of my cats love this food. I was feeding the one with the dehydrated raw food in it, but they really didn't care for it. Thought I would order this one because it hasn't got those bits. The cats love it. Decided to write this after switching to a different food. I tried “ natures variety” thinking grain free was a good idea. However after over 6 months of this diet, i noticed my two cats were lethargic and gaining weight. The food pellets in this food are so small that more food would fall from their automatic feeder than should have. Neither cat needed to chew the food so they would swallow it whole and later vomit it out. One cat developed very dry skin and heavy dandruff. I switched this month to a Royal Cannin food and already have noticed a difference in both cats. They are more playful and their coats are looking better. My 9 year old Russian Blue has been on this food for about 3 years now and he's in great shape. I've had him on Origin, Royal Canine, Evolution (Which was pretty good until it got discontinued) but this food is definitely the cats meow! For an 8 year old boy, he's active, alert, got a great body weight and a perfect body condition score. I highly recommend this. 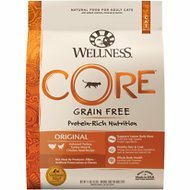 I feel good about giving this food to my cats and I recommend it for others. Excellent quality and no grains or by-products. Meat is the first ingredient. Thank you, Instinct! We rescued a kitten and have had her on the kitten version and she will now be turning a year so we have transitioned her to this food. She enjoys it and her coat looks great! I don't have any issues with her not eating it! I recently changed my kitten's dry food as it wasn't agreeing with him so I tried Nature's Variety Original. I wanted a dry food with no by products and better ingredients. I thought the transition to a different food might be difficult but my kitten loves it!